Everyone loves these boats full of potatoes and cheese. Make ahead and refrigerate. When ready to cook, bake them for an additional 10 minutes. They also freeze well. 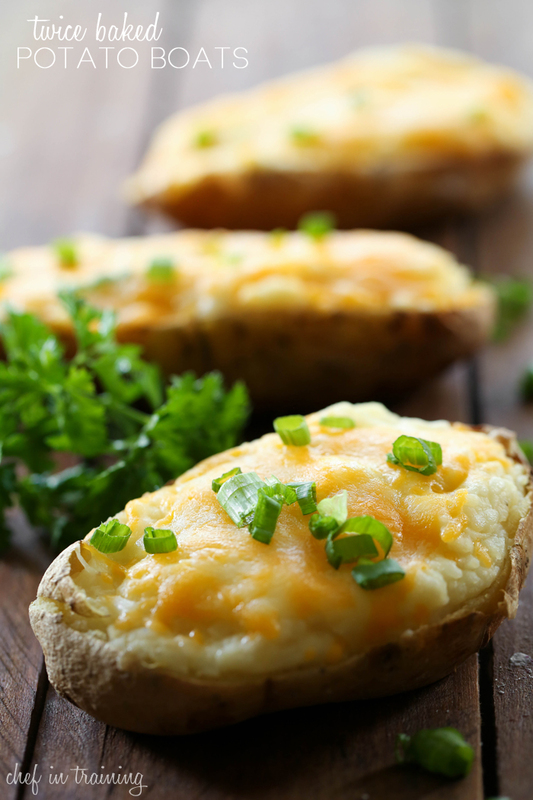 Cut baked potatoes in half, length-wise. With a spoon, carefully scoop out the middles of the potatoes and put them into a mixing bowl. Place baked potato skins on a parchment paper lined cookie sheet. Add butter, sour cream, salt and pepper, garlic salt and milk to the potatoes and beat until smooth. Do not over beat. Stir in Parmesan cheese. Scoop the potato mixture back into the skins and top with Colby jack cheese. Bake for about 15 minutes at 375 degrees F until the potatoes are heated through and the cheese is melted.